Founder, Community Animal Network Public Relations For Animals Animal Network of Orange County. A life of uncertainty at a county animal shelter is considered by most pet-lovers to be risking death. Especially animals that are old, need costly medical procedures, or act frightened, or become fractious behind bars in a seemingly scary place. Penny Lane became a lucky dog and beat all odds when a coworker overheard that the she was in the car and the animal control truck would soon arrive and she swept her up and took her home and called for help finding Penny Lane a new safe home. On the following day, the coworker excused her behavior saying it really wasn't her dog and said she was given the dog by someone who couldn't keep it. Community Animal Network's rescue phone lines tell of many uncommitted individuals who so easily discard their pets. It saddens most animal lovers to know that not all people consider their pets' as family members. Penny Lane had a health exam an a heart murmur was discovered. The two year old Penny Lane will need an eco-cardiogram to determine the severity. the previous owner claims to have had no idea of a medical condition. 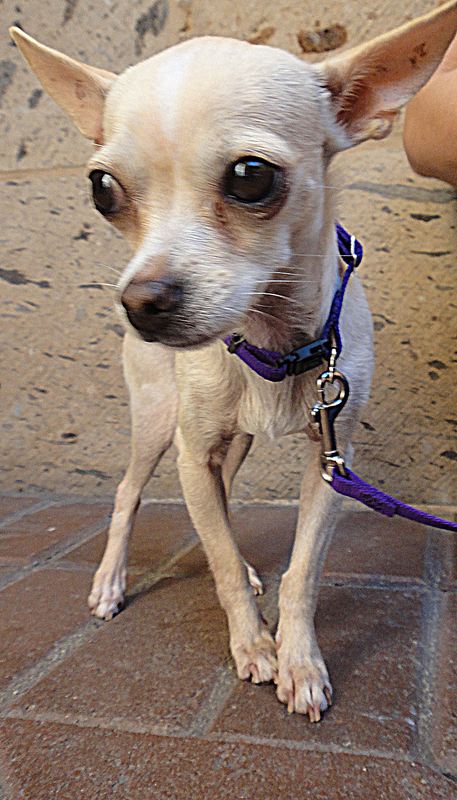 The tiny toy Chihuahua Penny Lane is very sweet. She gives kisses and prefers to be sitting on your lap. Your donations serve local animals. Please consider helping: Community Animal Network, P.O. Box 8662, Newport Beach, CA 92658, memo, “Help Local Animals”, Tax ID 33-0971560.